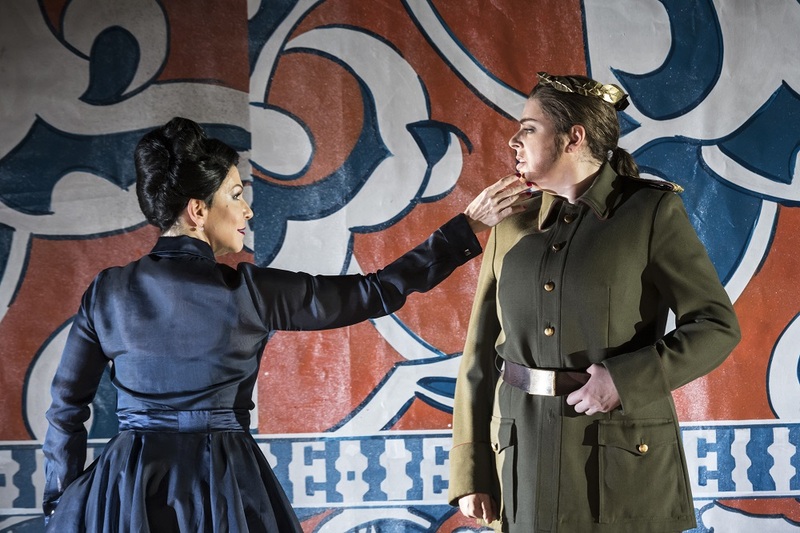 Whilst Rossini's Semiramide is his serious opera which has lingered longest in the repertoire when all but his comic operas were ignored, thanks to a series of divas keen to play the title role, the opera was last staged at Covent Garden well beyond living memory. The last production was more than a century ago, though there were three concert performances in the 1980s, yet remarkably the performance on Sunday afternoon, 19 November 2017, was the 75th at the Royal Opera House, a testament to the work's previous popularity. David Alden's production is shared with the Bavarian Staatsoper, Munich, where it has already premiered, and featured Joyce DiDonato in the title role, with Daniela Barcellona as Arsace, Lawrence Brownlee as Idreno, Jacquelyn Stucker as Azema, Balint Szabo as Oroe, and Konu Kim as Mitrane. Michele Pertusi was due to sing Assur but he was taken ill during the performance, so Pertusi sang Act One and Mirco Palazzi (who was due to sing the role next month) sang the second act. Sets were by Paul Steinberg and costumes by Buki Shiff, lighting by Michael Bauer and choreography by Beate Vollack. Antonio Pappano conducted the Royal Opera House Orchestra. The work was performed in the critical edition by Philip Gossett and Alberto Zedda. Alden's production set the work in an unspecified contemporary Middle-Eastern country, the iconography of the design reflecting the sort of 'dictator art' from such regimes, with a huge statue of Nino (Semiramide's late husband), and large pictures of the happy ruling family. Patterns from Islamic tiles also featured heavily, but there was also a hint of the museum in the large-scale rooms. The setting for the climactic scene at the end of Act One rather resembled the Victoria and Albert Museum. The excellent articles in the programme book made quite a lot of the fact that the tone of the opera verges on the semi-serious, with the treatment of the title role as somewhat inconsistent (sympathetic in Act One, and only gradually do we learn of her murderous instincts). 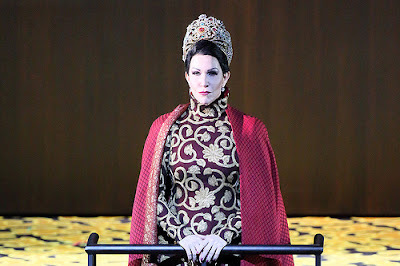 But Semiramide is a relatively old-fashioned work, though it builds on the operas Rossini wrote in Naples it lacks their theatrical and musical daring. Perhaps the plot can be seen as an early 19th century reflection of the Baroque practice of creating a sequence of highly dramatic situations without regarding the linearity of the plot. Certainly, the opportunities created for the title role are the main reason for the opera's 19th century longevity. Alden seems to have used this semi-serious tone to include a vein of near comedy. Whilst I could understand his treatment of Azema (Jacquelyn Stucker), the fact that her dress meant she could barely totter, had no access to her hands and was carried everywhere simply drew titters from the audience around me. More worryingly the choreography by Beate Vollack in the ensemble numbers was surprisingly skittish, almost sending up the atmosphere of the opening scene, and as the chorus and dancers were in costumes inspired by Islamic modes of dress this also felt a remarkably tone deaf measure. The arias and ensembles in the opera are remarkably long, and there was frankly an element of 'entertaining the troops' about Alden's staging. But, given the quality of the musical performance it was virtually impossible to upstage performances of the calibre and sheer musico-theatrical dazzle that we heard from Joyce DiDonato, Daniela Barcellona and Lawrence Brownlee. Both Michele Pertusi and Mirco Palazzi offered striking performances as Assur, with Palazzi opening Act Two with remarkable dramatic intensity, but given the circumstance and the fact that neither offered a complete performance it seems unfair to comment except to say that both artists provided a highly satisfying musico-dramatic performance. Joyce DiDonato's performance in the title role was simply astonishing. 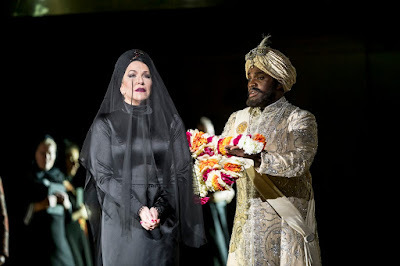 Semiramide is a somewhat tricky role; written for Isabella Colbran at the end of her career it sits rather low (see my interview with Albina Shagimuratova who sang it at the BBC Proms in 2016). DiDonato showed us her wonderfully firm middle and fine lower registers, whilst giving full due to the upper notes (Colbran was probably a mezzo-soprano with a high extension). Her singing of the role's complex passagework was vibrant and expressive, yet at no point did she seem to be knitting for the sake of it. Whilst her act one solo, 'Bel raggio lusinghier', was suitably ravishing and dazzling, it was with the Act Two duets with Assur (Mirco Palazzi) and Arsace (Daniela Barcellona), that the dramatic thrust of the work really takes place. Here Rossini moves away from convention to move the drama forward during the duet. That for Palazzi and DiDonato which opened Act Two made thrilling drama as the two struck sparks off each other. That for Barcellona and DiDonato was more complex, as Arsace struggled with the idea of killing his mother in revenge for her involvement in the murder of his father. 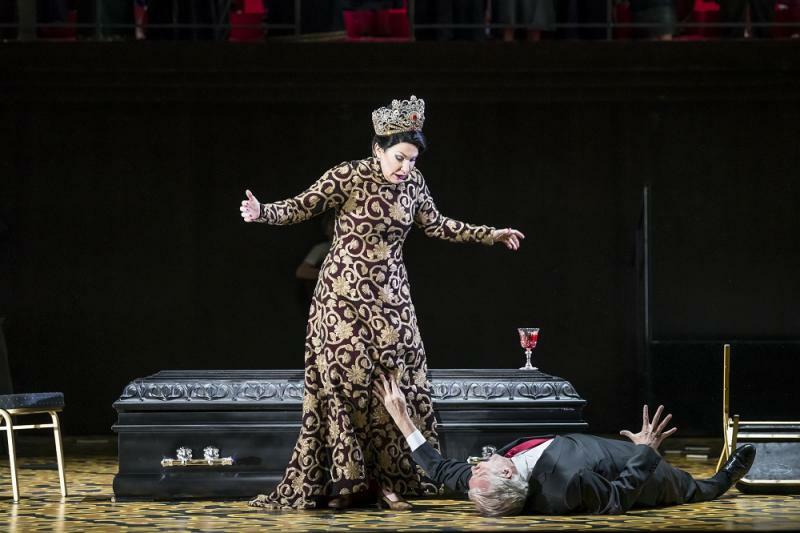 Daniela Barcellona continues to be go-to person at the moment for Rossini's travesty roles. She swaggers confidently, and sings the fioriture with the right degree of bravura and confidence. Occasionally her upper register seemed a little wayward, but this was a small thing. 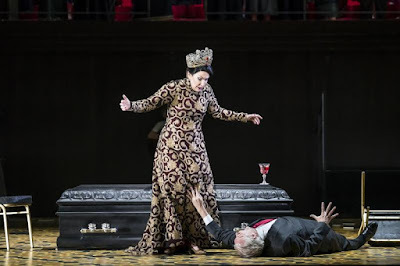 Arsace's duet with Assur in Act One, saw another dramatic highlight with Barcellona and Michele Pertusi knocking each other about musically as they competed for the love of Azema. Yet in Act Two, as I have said, things get more complex and Barcellona brought a finely nuanced approach to the moral complexities of the plot developments. 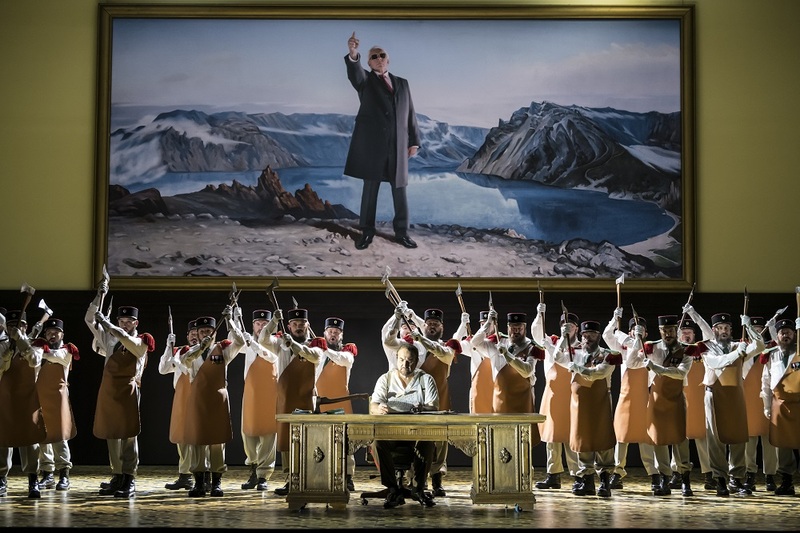 The role of Idreno is effectively dramatically redundant, it is simply there to give the tenor something to sing. But Lawrence Brownlee (looking very dashing as an Indian rajah, complete with turban), really took dramatic control of his two arias and made them highlights of the opera. His Idreno was not particularly nice and certainly not always sympathetic, with Brownlee using his technical facility to dramatic purpose, and the fact that his voice is so vibrant really counted here. Jacquelyn Stucker gave a sympathetic account of Azema, within the limitations of Alden's conception of the role, singing her role finely. Balint Szabo made a strong Oroe, the High Priest, a relatively small role which is dramatically very important, whilst Konu Kim was firm and to purpose as Mitrane, the captain of the royal guard. Simon Shibamu sang the off-stage voice of Nino's ghost. The production design lacked the fluidity of the previous day's production of Nico Muhly's Marnie at English National Opera (see my review), there was a lot of moving scenery around during the singing and a too great a reliance on that old chestnut, bringing the drop curtain down and having the singers complete the scene in front of it whilst thumps and bangs go on behind. And in the final scene, which takes place in the darkness of Nino's mausoleum, Alden and his team seem to have run out of ideas and simply kept the lights on and relied on our imagination. Antonio Pappano and the orchestra gave us a fine account of Rossini's score. This has the sort of richness to it (which critics of the time referred to as Germanic), which makes it satisfying in the right hands. Pappano drew a nicely fluid account of the overture from the orchestra, and throughout they made fine partners for the fireworks happening on stage. Rossini's Semiramide will always remain dramatically problematic, but Alden's production enable us to experience a wonderful combination of vocal fireworks and remarkably gripping drama. So what exactly is an haut-contre?